On the banks of Geneva lake, the city of Nyon has a long history. Firstly a Roman colony, the city becomes less important in favour of Geneva during the Middle Ages. The stones of its monuments are reused in the buildings of various locations, such as Bonmont, Geneva, Lausanne or Versoix. It is only during the modern period that the city gains importance. Different remains of its rich Roman past are still visible. A Roman colony is created by Julius Caesar between 50 and 44 BC near the Allobroge city of Genava (Geneva, GE). This colony, made for the veteran equestrians, is attested by archaeology since the end of the first century BC. 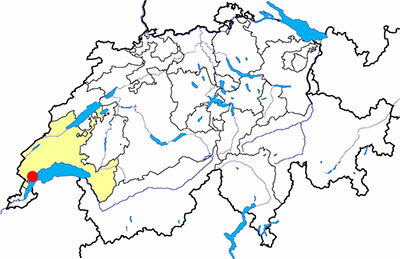 The exact area of the city is still uncertainty, but it is sure that it was smaller than the cities of Aventicum (Avenches, VD) or Augusta Raurica (Augst, BL). The monumental centre, composed with the forum, the macellum (food market) and the public baths, expands between the end of the first century BC and the first century AD; the amphitheatre is built at the beginning of the second century AD and the water is partly supplied by an aqueduct. The northern part of the forum basilica is discovered in 1974, during the demolition of a house wich covered it partially. Others later public works, mainly in 1991, allowed to complete the plan of the building. The excavations have allowed to discover in fact two basilicas which followed one after the other at the same place. The first one has been built at the beginning of the first century AD. It was divided in two parts in its length by a set of columns and its outer dimensions are approximately 13 x 58 metres. This basilica had two levels: a cryptoporticus, and an upper level, accessible with stairs from the public area. Around the middle of the first century, the fisrt forum with the basilica is demolished and a new forum, bigger and slightly shifted, is built. The new basilica has the following outer dimensions: 98 x 26.5 metres. It has a different plan than the first basilica: it has a central nerve with semi-circular apses, surrounded by an ambulatory, and there is an annex with apse at each end. Since 1975, the Roman museum is installed in the foundations of the second basilica, and in 1993, it is made bigger after the excavations in 1991. A part of the objects discovered during the excavations are exposed there, as well as some restored wall paintings from the villa rustica of Commugny (VD). Since 1999, the Roman museum organizes the International Festival of Archaeological Films. On the “Esplanade des Marronniers”, three columns with their entablature are easily accessible. These columns are not at their original place (they have been set up there in 1958 for the festivities of the 2000th birthday of the city) but come from the forum. They were part of the U-shape portico which circled the sacred area on three sides. Discovered in 1996 during a building site, the amphitheatre of Nyon is the sixth known in Switzerland, after those of Avenches, Augst, Bern (BE), Martigny (VS) and Windisch (AG). During the excavations, the walls of the arena, whose axis are 50 x 36 metres, have been found, but no external wall is yet known. Except the arena, two carceres (rooms for savage animals) and some water pipes have been studied. Despite the fact that the amphitheatre has been classified as an historical monument shortly after its discovery, the restoration itself has not begun and the monument is not yet open for public visits. An information panel as well as the temporary shelf of the amphitheatre only are visible from a neighbouring parcel. A development project exists and the works should begin in a few months. The water supply of the roman city was partially done with an aqueduct which departure was in the area of Divonne (France). The line of this aqueduct is mainly identified with the discovery of several subterranean parts, but nor the origin, neither the arrival are known. A part is still visitable in Grangette public square. During the Middle Ages, the Roman monuments became stone quarries for the new constructions, and several architecture blocks are still visible at several places in the medieval city. In the Sainte-Marie gate, beside the Esplanade des Marronniers, several sculpted blocks, included a column capital, are recognizable. The bust of an Attis statue is conserved in the top (southern face) of the Caesar tower, and a block with a sculpted side is used as basis in a pillar of the Marketplace.